Power Adapter Alarm review: Hey, your MagSafe adapter is unplugged! If you’ve ever wanted your MacBook to audibly notify you when you accidentally knocked the MagSafe power adapter from its socket, Eduardo N Hering’s Power Adapter Alarm (Mac App Store link) may be what you’ve been dreaming of. Power Adapter Alarm doesn’t try to perform every power-related function ever for your Apple notebook, but once the program has been enabled, it does achieve its goal of audibly squawking should you disconnect the MagSafe power adapter. The end result is either the default alarm noise or an audio file of your choice (in my case, the classic Bill Paxton “Game over, man!! !” quote from Aliens) being played on a continuous loop until you disable the sound file from the OS X menu bar. Power Adapter Alarm shines in its ease of configuration and it took only a few seconds to download the audio file I wanted, then configure the application to use it as my alarm sound. It’s simple enough to disable the program and customize the program’s preferences, then reenable it and run it normally. As of version 1.2.0, the program has some bugs that need to be sorted out, specifically in that the application won’t activate if you disconnect the MagSafe adapter while your notebook’s screen is closed. This is compounded by some awkwardness within the application itself, such as a bug wherein the program won’t remember the custom audio file you had configured and you’ll need to pointed to that file to use it as an alarm noise. 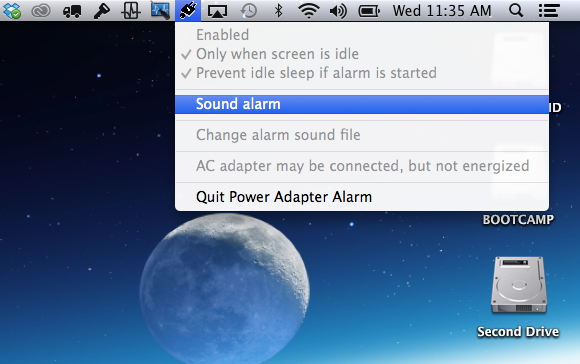 A few warts aside, Power Adapter Alarm offers a cool feature that more than a few people would like to see incorporated into OS X.